Ocotillo forest mortality in Big Bend National Park: Spring Break 2017. The flathead borer is attacking the desert thorn forest. The attack is so new that there is yet no publishing and its complete extent is not known. It could be an isolated occurrence in the Big Bend region of Texas, but because of climate change associated species collapse is now widespread across the planet, it’s not too likely that this is just a coincidental attack. Slowly and insidiously, or abruptly and finitely. Forests of all kinds are succumbing to climate change. Mountain forests, city forests, forests in the southeast and the far north. Pine, spruce, fir, oak, maple. Nontraditional forests too; the palms of LA, succulents in the desert. Yes, deserts are at risk too. Deserts as ecosystems are fragile places; living on the edge of nothingness. Forests can’t migrate when their climate changes, or they can do so only generationally through new offspring in a different place as the old disappear. Adaption they call it. Ecosystems are highly adapted communities of organisms. Plants (and their associated families of other living things) grow in very specific places with exactly the right amount of light, temperature, soil, and water. Change just one part of this formula and plants become stressed. Stressed organisms of any kind are more susceptible to disease and predatory attacks. If the stress continues for long, the number of stressed organisms dwindles or falls off dramatically depending upon the attacker. As the stressed organisms disappear, new ones fill the void. Sometimes the same organisms fill the void. With normal climate variations, the young are strong and capable of withstanding more stress than the old; until they mature, for now. As warming continues, the young will fail to mature or simply never return. We are already to the never return part of the story in some places. Today, our climate has changed significantly and widely. It’s warmer now than anytime in the last 100,000 years. Isn’t it obvious? How long do they think we will continue to believe their counsel that climate change is a hoax? Because out climate has already significantly changed, ecosystem collapse is now widespread. It happens every time there is an abrupt climate change, natural or not. A native species of bark beetle has killed 60 to 90 percent of the trees in 20 percent of Western North American forests. The mountain pine beetle is its name. It’s the most aggressive of the bark beetles and its attack began in the late 1990s as drought gripped the West. The attack is waning now as some 90 million acres have gone. The drought too, has subsided or so it appears. But new insects and disease are spreading epidemically. Fir beetle, spruce beetle, budworm and rust are now attacking at a rate that appears equal to the great dying from the mountain pine beetle. Why are these attacks happening now that drought has subsided? Apparent drought can continue because of warming, with normal or even above normal moisture returning to an area. Because evaporation increases nonlinearly with warming, it doesn’t mater how much it rains to the plants because they care about how much water is in the soil. As evaporation increases soil moisture decreases. Stress continues and collapse is assured. Stress from drought kills the little incrementally grown root hairs that feed most plants. It burns them off. Time is required for them to grow back. Research findings in Central Texas in the early 1990s showed that slow growing oak forests there were likely still stressed from the drought of the 1950s. The southern pine beetle, responsible for what was then believed to be catastrophic forest decline in the southeast in the 1970s and ’80s. It has now jumped to New Jersey and New England as the planet warms and is expected to rapidly make its way to the furthest reaches of forested lands in the north. The great drought in Texas and Oklahoma in 2011 killed 300 million trees. The drought in California since 2010 has killed 100 million. Up to 90 percent of the pinyon pine in the Four-corners region of the Southwest was killed by drought in 2002 and 2003. Billions of trees perished in two 100-year plus droughts in the Amazon, and now a new drought has struck in 2016, even more extreme than either of the previous two. A palm weevil, a native fungus and an Asian borer beetle are attacking the palms of Los Angeles. The urban forestry program in LA says: “In the next five years, the city will lose enough trees to disease and pests that it will take 30 to 50 years to replenish them.” Optimistically of course, what is not taken in to consideration is whether or not our new climate will support these species at all, irrigation or not. Not yet published or publicized is a new attack in the Chihuahuan Desert in West Texas. Big Bend National Park is part of the Rocky Mountains that in reality, extend from central Alaska to the tip of South America. At altitude in the Chisos Mountains of the Big Bend where a small forest remains as a remnant of the last ice age when times were cooler and wetter, pine numbers are plummeting as drought, beetles and disease have taken hold. But it’s what’s going on in the desert that is new. The ocotillo forest as I like to call it, is falling to a beetle larvae called the flathead borer. The ocotillo is a peculiar succulent-like shrub with thorns and singular tall unbranching stems numbering 10 to 30 per plant, growing from a central stem or trunk a few inches above the ground. The tall “Devil’s walking stick” branches extend up to about ten feet high and in the spring are adorned with a beautifully six inch spray of cherry red flowers upon the uppermost tips. Last spring break during a traditional desert sojourn, I spied a peculiar malady attacking the ocotillo en-masse. 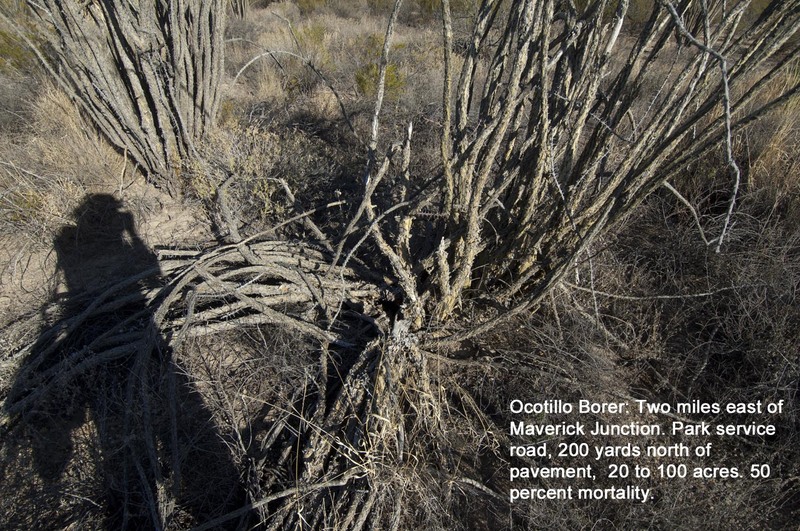 Across about 15 percent of the ocotillo forest in the park, as seen from a tour on pavement, four-wheel drive, and hiking trail, ocotillos were dying in epidemic numbers. In the most extreme, half of the ocotillos in sight were down. This flathead borer eats out an eighth of an inch of succulent stem beneath the bark of each of the Devil’s walking sticks. They attack in numbers and devour every stem on an individual plant and when their work is done, the ocotillo stems have lost so much of their support they sort of fall in on themselves like wet noodles.